Kumara haemanthifolia is a peculiar and interesting aloe. Its tightly arranged leaves with red to pinkish margins resemble a fan or the pages of a partly opened book and are very attractive and quite unlike any other stemless aloe. 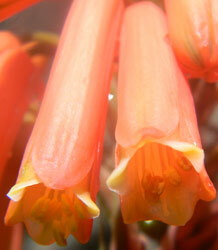 It was previously known as Aloe haemanthifolia. Kumara haemanthifolia is a robust plant that rarely grows singly and usually suckers freely to form groups of up to 20 plants at a time. These soft-bodied, thornless succulents possesses pale to dark green strap-shaped leaves which are up to 200 mm long and 80 mm wide with rounded apices. The oppositely arranged leaves have sheathing leaf bases which overlap to form clusters that lend a characteristic fan-like appearance to the plants which grow to approximately 500 mm in height. Superficially the plants look somewhat like a sister species, Kumara plicatilis, that also occurs in the fynbos mountains. The latter, however, is a small tree with a distinctive trunk and definite branches. Another unique difference between the two species is found in the leaf juices. In Kumara haemanthifolia the leaf juice is clear and watery while in Kumara plicatilis the juice solidifies to a thick, pale yellow and waxy substance. 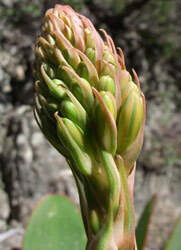 The flowers are borne on single capitate (head-shaped) racemes up to 500 mm high. Each raceme bears up to thirty tubular, slightly club-shaped, orange-red or scarlet flowers up to 38 mm long, widening at the mouth. The flowers appear in spring, from September to October. Kumara haemanthifolia has a very limited distribution range and was previously considered a rare species. However, there are at least 20 subpopulations that are all inside protected areas, and it thrives in an inaccessible habitat, so the species is currently assessed as Least Concern (LC) with no threats to its long-term survival. Kumara haemanthifolia is a true fynbos species. 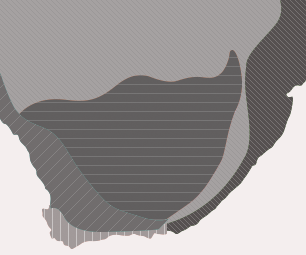 It is very restricted in range, occurring only on steep, rocky slopes, in damp, grassy situations on cool mountain peaks, at 500-1700 m altitude, in the Western Cape from Stellenbosch in the south to Ceres in the north. The plants inhabit a mostly south-facing aspect on steep rocky slopes to vertical cliffs of the Table Mountain Sandstone group. 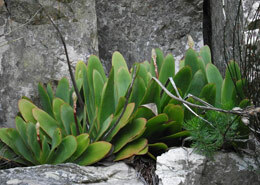 Kumara haemanthifolia was previously known as Aloe haemanthifolia. Molecular studies showing that the species in the old, broad concept of Aloe do not all share a common ancestor resulted in a revision of the genus, which saw the establishment of two new genera: Aloidendron for the tree aloes and Aloiampelos for the rambling aloes, and the reinstatment of the genus Kumara. There are only two species in the genus, the other being Kumara plicatilis (= Aloe plicatilis) the fan aloe. This genus Kumara was described by the German botanist Friedrich Kasimir Medikus, in 1786. Why he chose this name is not known. 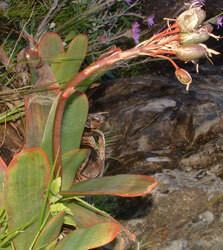 The species name haemanthifolia refers to the plant's leaves that have a striking resemblance to those of some species of the geophyte genus Haemanthus. Kumara haemanthifolia grows at high altitudes of between 500 m and 1700 m where, besides the high winter rainfall, they further benefit from mist and clouds that drift in during moderate to strong south-easterly winds that are associated with summer conditions in the Cape mountains. This, together with southern or south-eastern aspects, the moist but scanty peaty soils and the often nearly vertical situation, constitute an ideal habitat that enables this aloe to thrive under relatively protected conditions. To a degree it is these conditions that have contributed to the soft-bodied and defenceless appearance of the plants, whereas other aloes that grow in arid, open, sunny and easily accessible localities have developed either thorns as armour or bitter sap to discourage herbivory. Some arid aloes even employ the protection of pigments that act as sunscreen in the leaves giving the plants a reddish appearance during the hot and dry summers. In the case of Kumara haemanthifolia the leaves do not exude a bitter sap and there is no protective armour but the cliff habitat has become the protection of the plants. However, the young flowers, leaves and fruits are occasionally eaten by baboons that are amongst a handful of creatures that can access the plants with relative ease. The long-tubular and slightly club-shaped flowers produce nectar which is offered as a reward to pollinators such as sugar birds and winged and crawling insects. After fertilization, the fruits, which are capsules, swell out and grow quickly, later becoming woody, before splitting into 3 equal parts in summer to release the black, slightly winged seeds which are dispersed by the wind. Since the plants occur on cliffs, ledges and steep slopes, the seeds are easily carried on the slightest of breezes onto nearby slopes either below, adjacent or above the parent plants. Consequently, recruitment of seedlings is very successful in its natural habitat. No uses whatsoever are recorded for Kumara haemanthifolia, and one must assume that this is partly due to its restricted habitat. Kumara haemanthifolia grows best from freshly harvested seeds but can also be grown from suckers. However, this species has never really taken off as a garden or container plant and very rarely flowers in cultivation. Like Aloe polyphylla from the misty Lesotho highlands, Kumara haemanthifolia does not take kindly to cultivation and simply refuses to survive very long in Cape Town gardens, or any other garden, for that matter. Kumara haemanthifolia is highly dependent on the cool and moist mountain microclimate which, if lacking to a degree, will cause much frustration to even the most avid gardener or lover of aloes, as the plants will refuse to thrive. They are best left to be admired in the wild where their true beauty can be best appreciated. Reynolds, G.W. 1950. The aloes of South Africa. Trustees of the Aloes of South Africa Book Fund, Johannesburg. Stearn, W.T. 2003. Stearn's dictionary of plant names for the gardener .Cassel, UK. Van Wyk, B-E. & Smith, G. 1996. Guide to aloes of South Africa .Briza Publications, Pretoria.